We all have scraps. Scraps of patterned paper, colored cardstock, glitter paper, you name it! And what better way is there to utilize scraps? Die cut them! 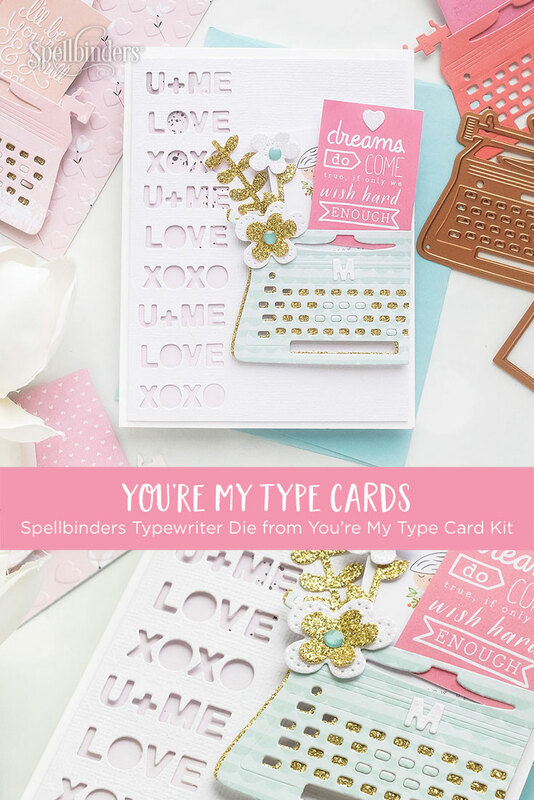 Today I have 4 die cut typewriter cards made using scraps from my stash and a typewriter die from SpellbindersJanuary 2019 Card Kit of the Month (I’m not using anything else from the kit)! 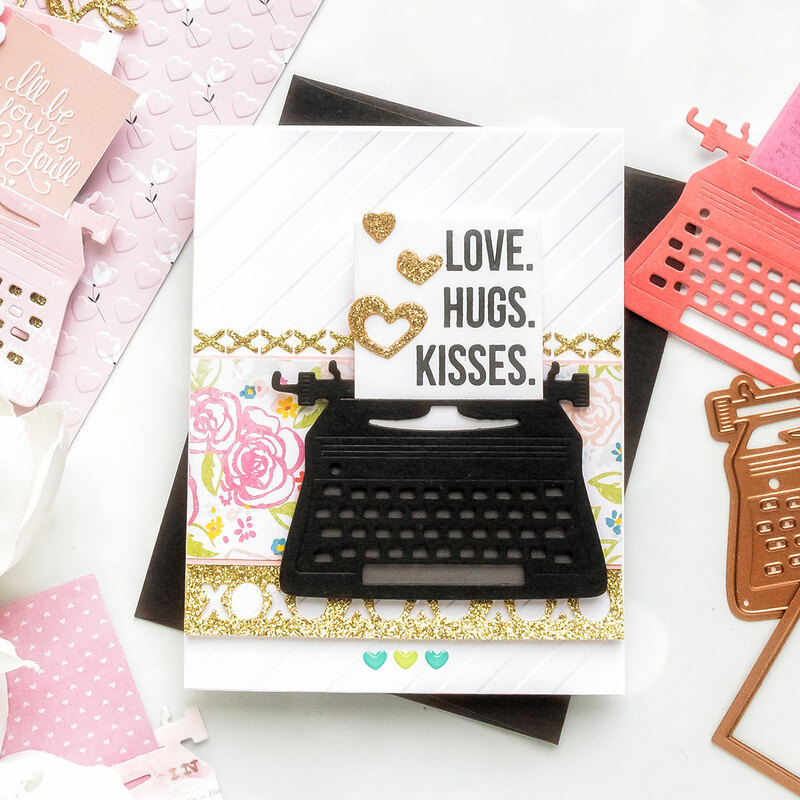 To create this card die-cut typewriter out of black cardstock and foam mount onto a gray mat. 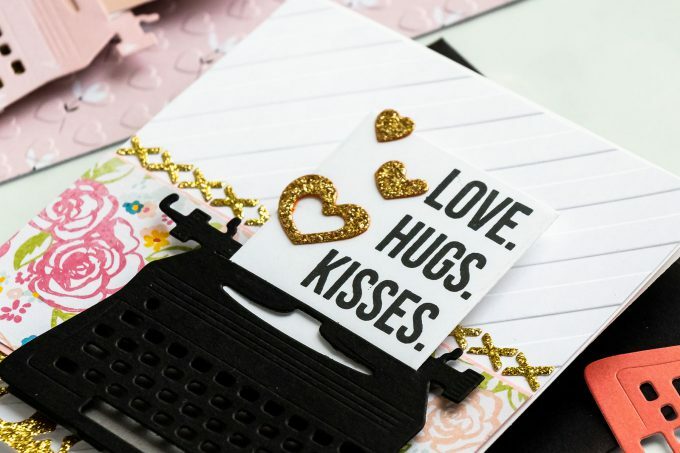 Next, die-cut a white rectangle and stamp Love Hugs Kisses using black ink. I die-cut a gold glitter cardstock border using XOXO die. I also kept the positive “x” die cuts and used them to make a faux cross stitch border in the top section of my card. To create a background I dry embossed white cardstock panel for my card using Love Stripe embossing folder. I also cut another strip of pink cardstock to layer over the white one and added a piece of patterned paper from my stash over it. 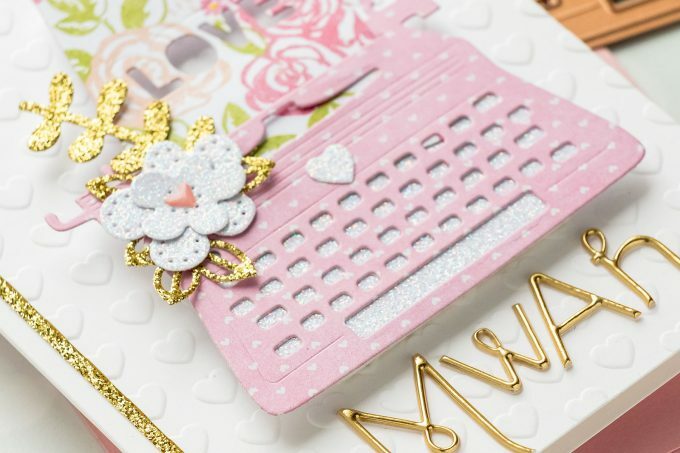 Finally, I foam mounted my typewriter on top and added a few die cut gold glitter hearts. For my next card idea I used patterned paper to die-cut my typewriter from. 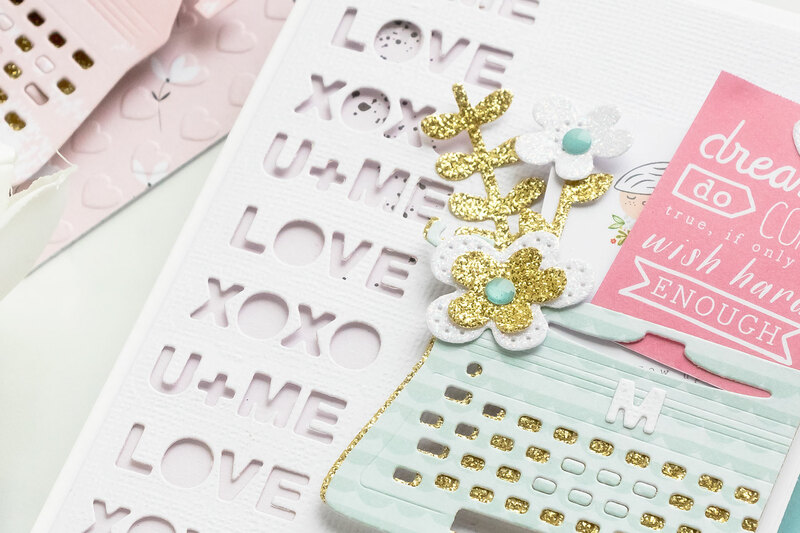 Don’t limit yourself just to colored cardstock – use the pretty pattern papers for die cutting as well! 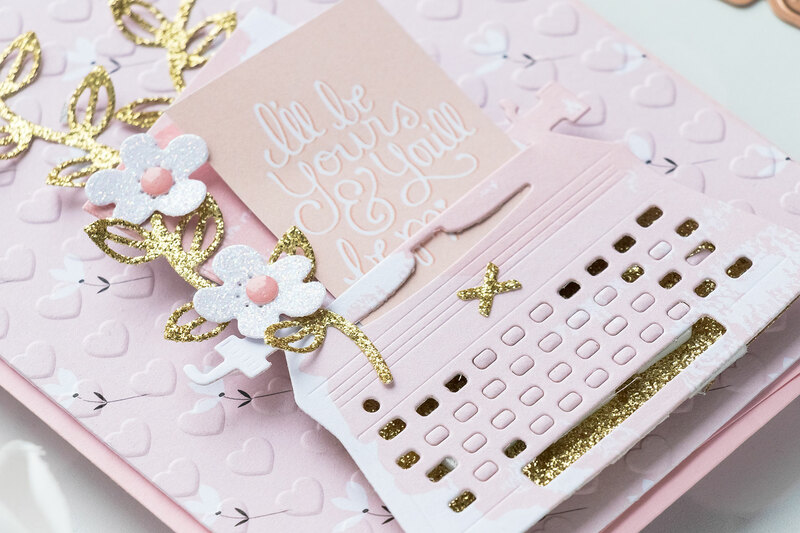 I die-cut the word LOVE in the piece of paper coming out from the typewriter and also added a bunch of delicate glitter flowers and leaves. 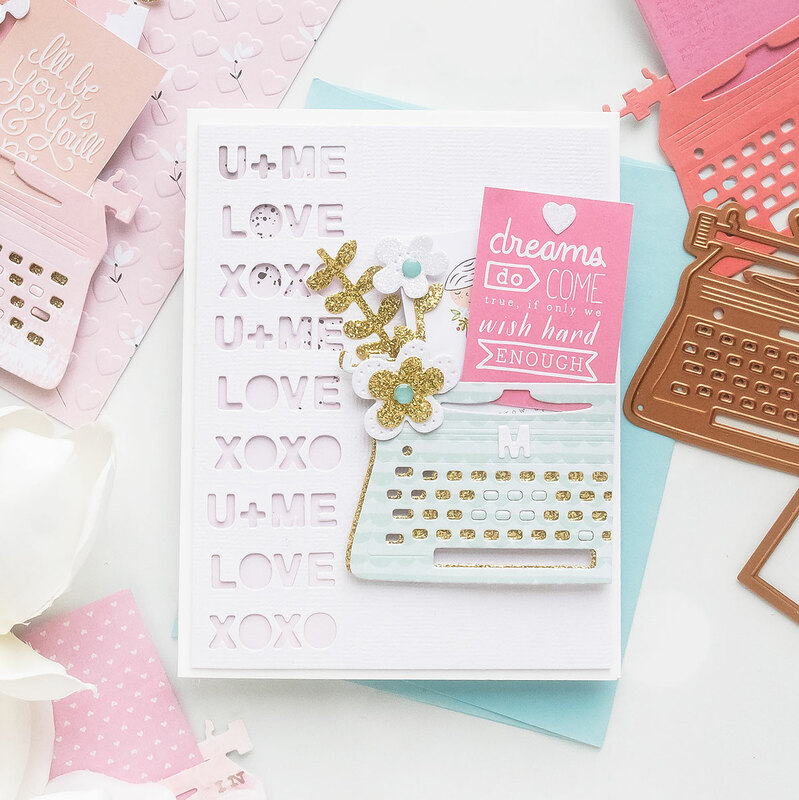 For my background I dry embossed a beautiful hearts background using I Heart embossing folder and simply foam mounted the typewriter on top. I added a strip of gold glitter paper to coordinate with some of leafy die cuts I have embellishing my typewriter. 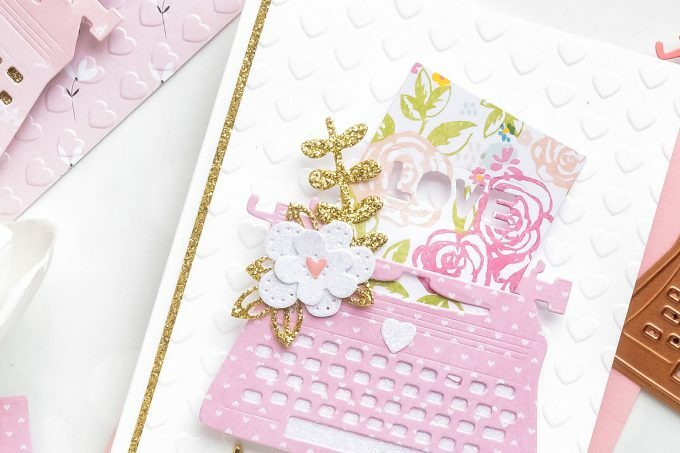 Notice how I decorated the center of the typewriter with a little heart – that’s where the make of the tool is usually mentioned so I felt it was a good spot to add a white glitter heart to dress this card up. Finally, I added a little MWAH spelled out using some old alphabet stickers from my stash. 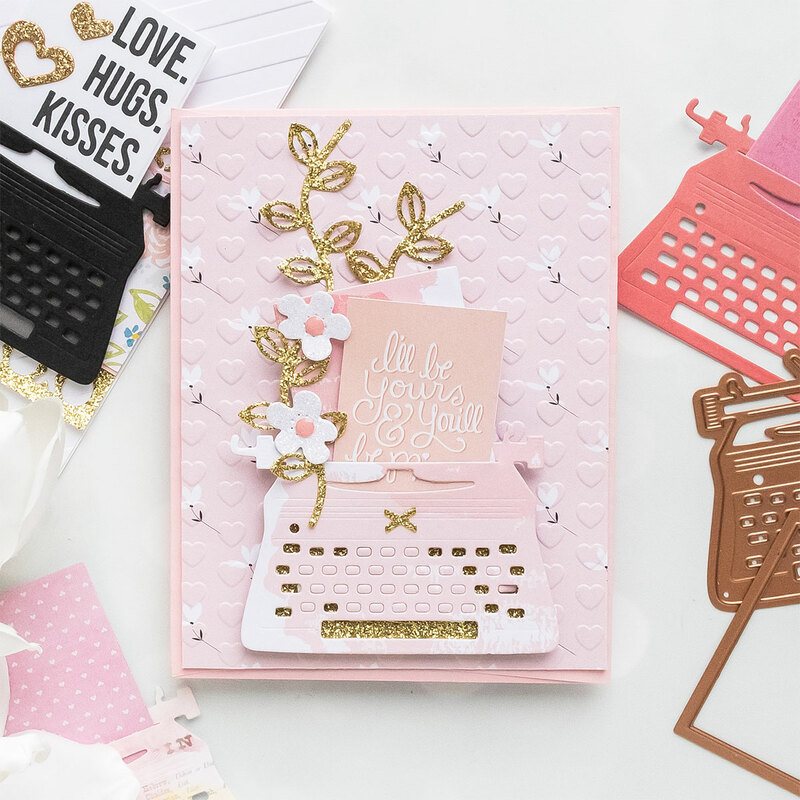 For my card idea #3 I decided to used little journaling cards you’d find in 6×6″ paper pads with the typewriter instead of a die cut message. I die cut cut a rectangle using the die included with the typewriter, but also added that little journaling card. 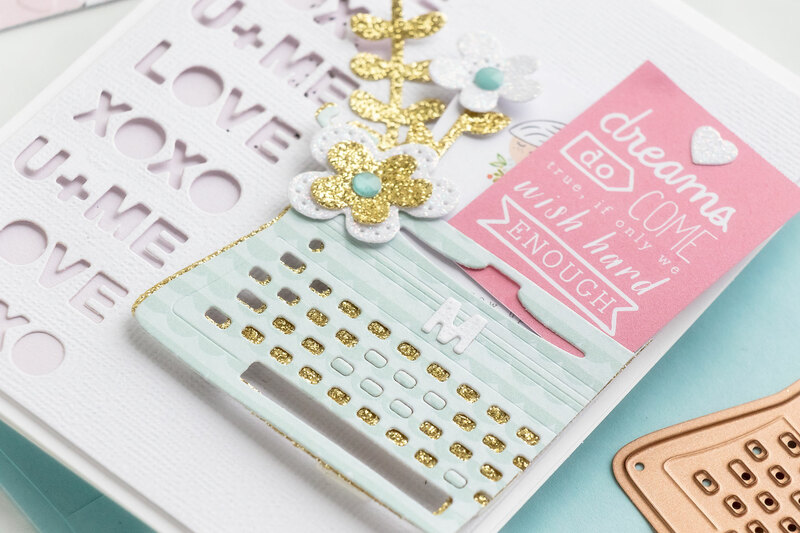 For the background of this card I dry embossed a piece of patterned paper using same I Heart embossing folder to show you a different use – you don’t always have to dry emboss white or colored crardstock, patterned paper can be dry embossed as well! For my typewriter I added some foam adhesive from the back of the typewriter to secure some of the die cut keys so they wont fall out. I wanted to keep some inlayed in my typewriter and not punch all of them out this time. I added gold glitter paper backing to my typewriter, placed it at the bottom of my panel and added several gold glitter die cut leafy branches coming from the typewriter to the top of my card. I loosely adhered them in place, and that finished my card! For this card I decided to do some background die cut using the word dies in this kit. There are 3 dies that read XOXO, LOVE and U+ME, they are all intended to go with the typewriter, to be die cut in that letter that fits inside the typewriter, but you can use them on their own like I did for a border on my 1st card or like I did here to die-cut a background. I layered a piece of light pink pattered paper under the die cuts to have a bit of pink show through. For the typewriter I used patterned paper and also added two journaling cards from 6×6 paper pad from my stash – they are so cute and went together with the typewriter perfectly. I layered a gold glitter die cut under the blue one and offset it slightly. I trimmed my typewriter to create a partial one as I wanted to have it positioned off to the side of the card. 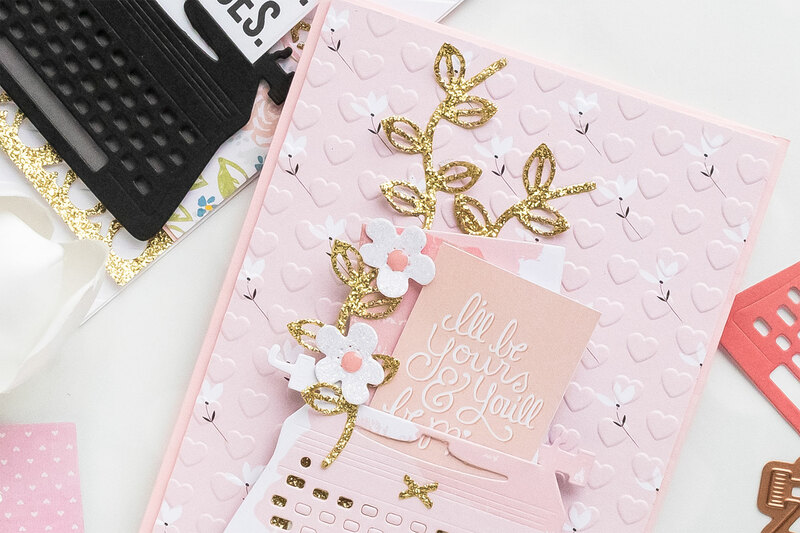 I foam mounted the typewriter in place, I added some beautiful florals and leaves as well as a letter M in the center where the branding goes and I adhered this panel onto an A2 white side folding card base. I had a blast making these cards with the Typewriter die from the You’re My Type January 2019 Card Kit. This die is only available as a part of the kit which is a membership subscription program. Current members get first dibs on the monthly designs, become a member so you don’t miss out! Adorable and so pretty. Love the pink and gold. Thanks, Yana. I love that adorable typewriter. The cards are so fabulous! Thanks, Yana for the great tutorials, endless ideas and inspiration. I just love your cards and would absolutely buy this kit but don’t want to sign up for a subscription! Kinda sad that one can’t just buy the kit – love the typewriter too!!! Love all 4 cards and wish that die was available separately. My crafting budget doesn’t allow kit purchases. 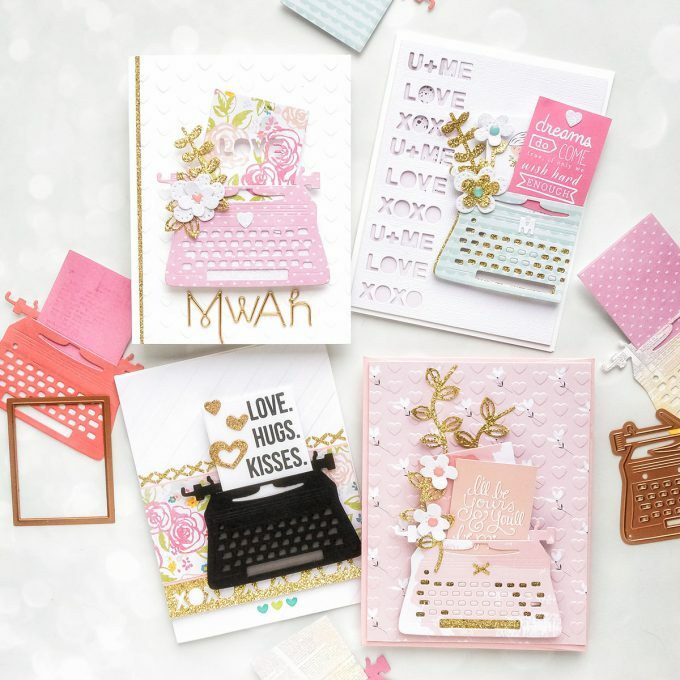 Gorgeous cards and so creative! I love that typewriter die. 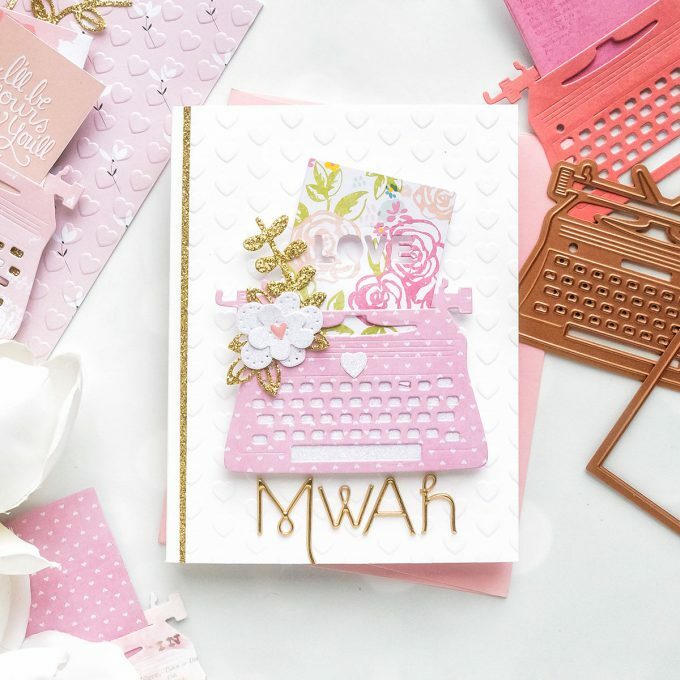 The all pink card is my favorite!